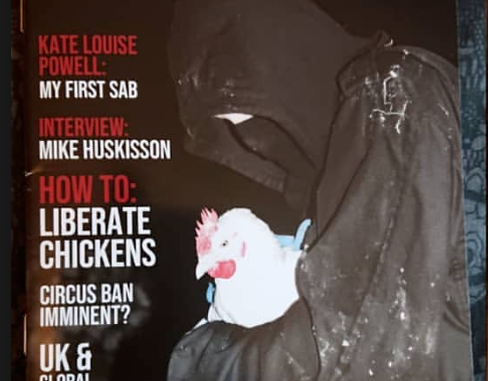 How many animal rights magazines are there in the UK nowadays? Very few indeed. Animal Aid, the HSA and the ALF Supporters Group produce house journals but independent publications like ARC News or Arkangel ? As far as I’m aware there were none at all – which isn’t surprising as print journalism is said to be in its knees – until up popped the Agitator last month. First thing to strike me about this magazine is it’s well produced. Full colour, glossy and A5 pocket size, which makes a real difference. Good use of graphics and the right balance between text and photos means it’s an easy read. Content is well balanced too with something for everyone. First up is a two page feature called How to Liberate Chickens. It’s mainly good sensible stuff although I feel not enough emphasis is given to security before the raid. For example it says phones should be left at home during the raid but doesn’t say you should never use them in planning either. Next are several pages of News which includes reports of interest to activists from the last few months. It’s wide ranging, everything from “Celebs urge prime minister to use brexit to ban fur imports” to “ALF liberate 75 turkeys from UK farm” to “Protest at fur shop in Nottingham” to an arson and graffiti attack on a McDonald’s in Paris on Mayday. Two actions are covered in some depth. First the release of up to 20,000 partridges and pheasants from two intensive game farms in Devon and Kent in April. The former was claimed by the ALF but no-one has owned up to latter yet. Second, a graffiti attack on a butchers shop in Ashford, Kent. There are two interviews. The first is with Mike Huskisson, an inspirational figure for over four decades, first for rescuing beagles forced to inhale cigarette smoke by ICI in 1975, and since then for his incessant anti-hunting activism. The second interview is with an anonymous ALF activist. This concentrates on successful campaigns against Cocksparrow Fur Farm and Laundry Farm where Cambridge University tested immunosuppressant drugs on dogs. Again this is inspiring stuff, reminding us of an era when the movement could topple animal abuse establishments. As well as the above there is also “My first time hunt sabbing” by Kate Louise Powell, an article on the badger cull (“Badger a Tory”), a Veganarchist Cookbook fake & ale pie recipe, a support animal liberation prisoners page, an introduction to Freedom for Animals – formerly Captive Animals Protection Society – and its campaigns and a lighthearted agony column by “Agony Anti…” with made up questions like “I thought my partner was cheating on me, so I got someone to follow him. He was going to Burger King!” Finally “Blast from the past” reports on the Brown Dog Riots of 1907. A real hodgepodge then, but it works. On one level the Agitator reminds me of Arkangel, a magazine that was steeped in the direct action tradition yet understood the necessity of covering the wider movement. Where the Agitator wins out is its A5 format, glossy pages, liberal use of photos and pictures, short snappy articles and sense of humour. It’s aimed at the social media generation who want something accessible and easy to read. Long complex articles on strategic issues are probably better suited to blogs like this. Unoffensive Animal has a website that is still under construction at present. There is also a Facebook page.